We all have ever-growing stacks of books in our houses. I thought I'd share just some of the books I'm looking forward to reading. This list contains review copies, ARCs, my own books, and library books. Which of these should I get to quickly? What books in your TBR pile are you looking forward to reading? 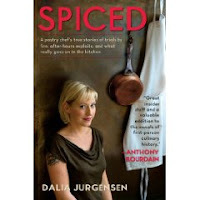 I read Spiced though I haven't reviewed it yet. Fun, light and yummy. I'm reading Spiced now. It makes me want to make sure I leave a tip for the cooks in the restaurant as well as the waitstaff! I agree with Marie's evaluation! The only one we share in the TBR pile is The Angels Game. I have 6 cookbooks I have to go through this weekend. I haven't read any of these, but I'm currently reading Tom Standage's HISTORY OF THE WORLD IN SIX GLASSES -- an interesting, though necessarily limited, overview of world history. Didn't know he had a new book out! I was hoping to see pictures of your bookcase! I'm reading Life's That Way right now and the writing's great, but be prepared with a box of tissues when you start it. I'm reading The Big House now. It's nonfiction, though, and takes a look at Colt's family summer home on Cape Cod...the family history, his memories, etc. So far it is very good! I can't wait to read Spiced, but I also really want to read Perfection since I read the first chapter and I see that it has a lot of food in it. I don't think I will get to either of them until next month though. Haven't read any of these yet, but I have The Angel's Game and Burnt Shadows on my TBR, so I selfishly recommend one of those to see what you think! Molly: I agree that the books look great. Marie: I'll be looking for your review. It sounds like it's going to be similar to Kitchen Confidential (which I loved). Rhapsody: I'll be looking for your review too. Cindy: Oh darn, I wish I "had" to go through six cookbooks! Mindy: I liked his Six Glasses, which is why I requested a copy of this new one. Kathy/Bermuda: I will be reading Life's That Way soon. I'll be prepared with my tissues. JoAnn: Ooops! I've changed the heading. I didn't realize it was nonfiction because it was shelved with the fiction at my library. Nicole: I'll have to look for Perfection. Meghan: I've been dying to read both of those books, so I may indeed get to them before you. I haven't read anything either, but I do have The Angel Game. However, I really wanted both "An Edible History of Humanity" and "Burnt Shadows" and didn't get them, so I REALLY want you to get to those so I can see whether I should go out and get them when they are published. Jen: I'll do my best to get to them soon! umm..I have not read any of them, but a couple of them are on my very own mountain! You will probably get to yours before I get to mine--there are so many lined up a head of these at my house. Zafon is a great writer.. I would love to read The Angel's Game by Carlos Ruiz Zafón. I have been waiting for a while to get this. I just loved The Shadow of the Wind!!! I haven't read any of those yet, but I suggest THE ANGEL'S GAME! I haven't read any of these, but have Crossed Wires on my list. 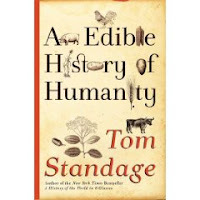 I haven't read any of these but I would certainly love to read The Edible History of Humanity and I have heard a lot about The Burnt Shadows. This is such a great idea! I hope that you make it a regular feature. Seperating out your books by genre was a nice touch. I haven't read any of the books but have Spiced and The Angels game in my own TBR. I have Burnt Shadows here to read, too! I was going to start it last night, but something else caught my attention... Hope you enjoy your books! Kim: I'm not sure I'll get to them first or not. But The Big House is from the library so that has a definite deadline. Gautami, Myza, Julie: I loved The Shadow of the Wind and I couldn't stop telling everyone to read it. I'm excited to read this one. Stacy: That one looked fun. Lilly: Yes, they both look good. I was so excited to get Burnt Shadows. Bonnie: Thanks. I was thinking of making it an occasional feature. Kailana: Oh, you'll probably get to it before me, but I think it looks great. Haha yup Beth. I would just read whatever I picked up there but I got some blog tours coming up I need to prepare for. So I'll just have to pet any new books for the time being lol! The foodie ones look good! I've got Angel's Game on deck here, too. More than 1/2 way through Shadow of the Wind in preparation. I haven't read a single one, but of course I would vote for the foodies. I will be watching closely for your reviews on these. You know how I am about cooking! The only two I've even glanced at have been The Epicure's Lament and Angel's Game. I started reading The Epicure's Lament but had to return it to the library before I finished. It was pretty good. Your post makes me want to write a post about my own TBR pile! Happy reading! Looks like you've got some good reading ahead of you! I need to get to a few of those myself! All these books look great. The only one I've read is Crossed Wires and loved it. I'm not sure what drives me to look at book covers. It must be the anticipation of the pleasure that lies ahead. In this case, I'm looking forward to reading what you thought of all these books. And, who knows, I may read some of them too. i haven't read any in your tbr pile but am interested in your reviews of the two memoirs--one of my favorite genres. i'll keep my eyes peeled for your opinion. good luck scaling the mountain! these are new-to-me books. Thanks for sharing them. Great list. I also have a growing pile and was thinking of listing it out on my blog as well. Happy reading! I read Crossed Wires a few weeks ago and really, really enjoyed it! Of course, I'm obsessed with all things British so I'm a bit biased, but it really is a sweet, loveable story :) Great setting, great characters. Very real. I really want The Angel's Game!!! I have Spiced, which I have heard is hard to get into, but I hope that isn't the case because I don't need another one of those. I hope you enjoy your reads! I love your list of foodie books - I'm going to check out these for myself. I can't wait to read The Angel's Game, but want to be able to read it slowly and savor it, so I haven't gotten to it yet! Read BURNT SHADOWS - it's just beautiful. Everything you want in a historical fiction. Hiroko is my heroine!